There is an inverse relationship between the severity of hair loss and the amount of donor available. 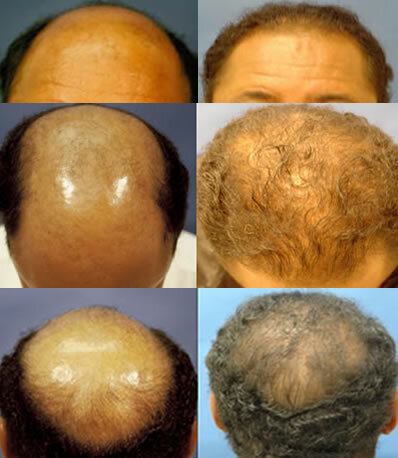 That is the more severe the hair loss the less donor available for the hair restoration procedure. The average Caucasian individual is born with 50,000 fu (follicular units) on their heads. The average density is 100 fu./cm squared. An individual with advanced stage hair loss, Norwood 6 or 7, usually has on average between 230- 300 cm square of bald scalp. To restore this individual to his original density would require about 30,000 fu (300×100). That is more follicular units than the total remaining on the heads of these follicular unit challenged individuals. Fortunately, it is not necessary to achieve such density. It has been shown that the threshold for visible detection of thinning for the human eye is below 50-fu/cm sq. Even then, 15,000 fu is required to stay above the threshold of detection of thinning. 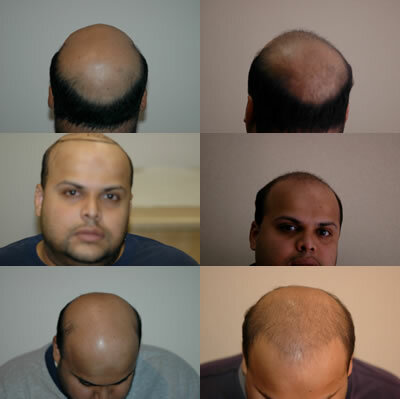 Employing modern hair restoration techniques, one is able to obtain very pleasing outcomes for the majority of these individuals with advanced hair loss, while employing much lower numbers of follicular units. The key to successful hair restoration outcomes then lies in the use of these state of the art hair restoration techniques, since it is always the patient with the most need that has the least donor available for hair transplantation. The average individual has between 4-10,000 fu available. No one ever complains about getting too much hair, hence it is usually best to do the largest session the patient can afford and the available donor can support. With favorable hair characteristics, and reasonable patient expectations we can achieve excellent results in as little as one to two procedures. It is imperative that the patient has realistic expectations, which includes that the crown area will likely not be able to be covered with any significant density. My preference is to focus on restoring the hairline, frontal forelock, frontal region and mid scalp region. The crown is left to pharmacologic therapy, hair system or comb over from anteriorly transplanted hair. The exception is for the fortunate few with great donor density that permits harvesting in excess of 4000 fu. The breakdown of a 4000 fu transplant is to do between 1500 to 2100 fu in the hairline and frontal forelock areas, and the remaining 2000 fu is distributed between the remaining frontal and mid scalp regions. The densities created are 50-70 fu/cm2 for the hairline/forelock, and about 20 fu/cm2 for the frontal core and mid scalp areas. The crown area is determined by pie x r2 (3.14 times radius squared). Hence, the area increases exponentially with the increase in radius. For example a crown with a radius of 5 cm has an area of about 78 cm2, and a crown with a radius of 6 cm has an area of 110 cm2, thus the area increases about 50% for an increment of 1 cm in radius. To obtain even a thin coverage we need a density of at least 20 fu/cm2 so the total required for the 5cm crown is 1600 fu and 2200 fu for the 6 cm one. To secure a medium density we need 30 fu/cm2, so2400 and 3300 fu respectfully. An astounding, 4000 and 5500 fu is required to obtain a dense (no apparent thinning requiring 50 fu/cm2). So clearly it fallows that before we are able to address the crown loss, we need to satisfy the hairline/frontal/mid scalp areas, before proceeding cautiously to decrease the size of the crown hair loss. In the crown area, we work from the periphery to the center, it is important to restore the hair lost first, last. In other words, we start to restore from the periphery and work in towards the center. The advanced stage Norwood 7 typically requires between 5000-6000 fu to satisfy even thin crown coverage. Hence, all advance stage Norwood’s require mega sessions. The term mega session in hair restoration has been an upward moving target. Not too long ago 1000 to 1500 fu was considered a mega session. The use of binocular microscopy to sliver and trim the follicular units has greatly improved our donor yields, on average increasing donor yields by about 25%. Optimal donor harvesting delivers higher yields while conserving this limited resource. Hence, today we are able to offer properly selected patients the option of maximizing their hair restoration outcomes with cases that have surged to the five to six thousand levels. Indeed Rome was not build in a day, but it is nice to have the option to minimize the need for multiple procedures, while maximizing our patient’s hair restoration outcomes.